Each unique disease contains its own unique state of mind as well as a unique feeling. When studying remedies, or explaining their essence to a patient, I like to relate a remedy to a commonly known piece of art (music, television show character, movie, etc. ), which is a convenient shortcut for illustrating the state of mind and feeling of a given disease. Likewise, I may give a patient “homework” to watch a particular film, or listen to a certain piece of music in order to aid in the work they are doing with a particular remedy, and more completely process the inner content of that disease and its feeling. The inherited aspect of disease is key to Heilkunst treatment, through the systematic elimination of the diseases we call “the chronic miasms”. Each miasm will be related to a particular aspect of the family health history, such as to heart disease, cancer, or allergies, and so on. Each miasm will be related to a range of these physical symptoms in the family health history, as well as to a fundamental feeling and state of mind unique to each one. In fact, the true method of “preventative” medicine relates to treating these diseases while they are primarily still in the form of a state of mind and feeling, and long before it may have devolved into physical symptoms. The acute phase of each miasm will also have a certain seasonal aspect, related to a certain segment of the calendar year. The ringworm miasm starts to become more prominent around this time of year, roughly starting on Feb. 2nd, or “Groundhog Day”. By the nature of artistic genius and expression, it so happens that the feeling and state of mind portrayed in the Bill Murray film of the same name precisely captures the feeling and theme of the Ringworm miasm (but with humorous overtones laid on top). If you have not seen this movie yet, it is certainly worth treating yourself to a viewing of this classic romantic comedy. Or, as with all rich works of art, subsequent viewings often continue to pay off with meaning and perspectives you hadn’t yet seen. Reflecting on the state of mind of Ringworm will add a whole new dimension to it. Without giving too much of the movie away, its central idea is set in an alternate reality, where the main character discovers himself trapped in a small town re-living the exact same day over and over and over (and over and over and over). He is the only one in the town who realizes this predicament, and therefore the only one who feels trapped, and desperately so. He alternates between scenes of having greater hope, and attempting to find a way out, and other times of completely giving up hope and wallowing in his own misery and depression, even to the point of suicide (which does not even release him, as he keeps waking up the next morning to relive the same day yet again). This is the feeling in the Ringworm miasm — phases of hope and attempting to move forward, but always to come against the same old issues again and again, and ultimately to give up. It matches with the folklore around Groundhog Day, where the long winter days of cold and darkness can go either way — 6 more weeks of drudgery, or an early Spring possibly right around the corner, if the groundhog doesn’t retreat from the sight of his own shadow. It is very rewarding to be able to witness patients “break out” of any number of long-standing issues which they have felt trapped in for a long time, and to discover new life and a fresh path forward for themselves. 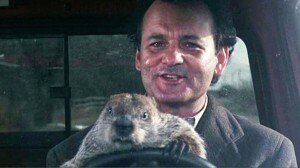 Which way will your Groundhog Day point you this year?